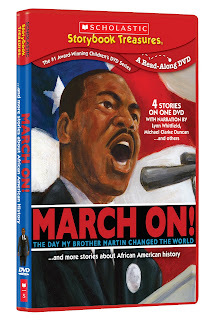 A terrific collection of films for Black History Month comes from Scholastic, “March On! … and more stories about African American History.” It includes four stories on one DVD celebrating Martin Luther King, Rosa Parks, and other people who have helped shaped African American history. The title tale (March On: The Day My Brother Martin Changed the World), based on the book by Dr. Christine King Ferris, sister of Martin Luther King, is a wonderful story about partnership and equality. The collection of actual photographs and illustrations makes for an interesting way to view the story. Younger kids may get bored with all the still photographs but, they illustrate important events in the history of our country. The March in Washington D.C. was based on love and peace. That is what is made clear in this film. It definitely gives viewers things to think about. The background of Martin Luther King Jr. from his sister’s point of view is interesting. I would recommend this DVD for kids age eight and older. This is a show that makes everyone think about how we treat others. It shows how people in the 60s worked towards equality and peace. The basis of Martin Luther King Jr’s speech is still true today. We cannot move forward unless we consider everyone equal. We must have hope and move ahead with our own dreams. We must work together and speak up for what is right. This entry was posted on Thursday, January 28th, 2010 at 12:08 pm and is filed under Uncategorized. You can follow any responses to this entry through the RSS 2.0 feed. You can leave a response, or trackback from your own site.